The second dressy look of How to Style Slogan T-Shirts is all about tailoring. Besides feminine skirts, a well-tailored pair of trousers can dress and smarten up a basic piece like a t-shirt. In Look 1 of How to Style Corsets, I styled a corset t-shirt with wide-legged trousers. This time, I opted for cigarette trousers. I wore my black ones so much in Autumn/Winter that I bought another pair in a lighter colour for Spring/Summer. 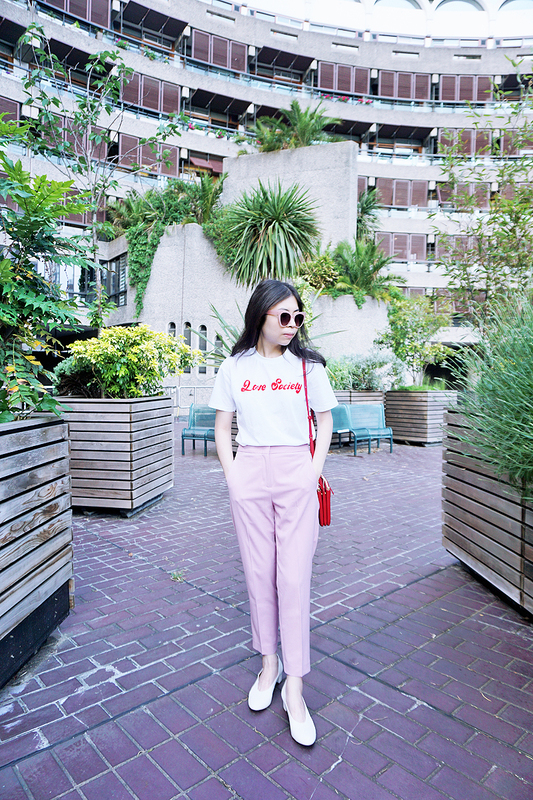 As you can see from a previous outfit post, I really like the combination of blush pink and red, so it was a no-brainer to pair the trousers with my Ganni 'Love Society' t-shirt. I love the font of the slogan; it looks so retro! For the accessories, I wanted to them to be in the same colour palette as the clothes. Hence, the sunglasses match the cigarette trousers, the bag matches the colour of the slogan and the shoes match the colour of the t-shirt.